Chevron Corp. announced a new global advertising campaign this week aimed at showing Chevron as a “real people” corporation, and admitting to abuses that companies usually try to hide. The e-mails I received w/ the (fake) press releases titled «Radical Chevron Ad Campaign Highlights Victims» and «STATEMENT: Chevron Deplores Subterfuge, Investigates Options» had raw header data like “Received from:” and IP-ranges like previous Yes Men newsletter e-mails. Only the “Sender:” falsely stated something like “x@chevron-press.com” and “x@chevron-corp.com” which leads (now) to the official “chevron.com” but has a different registrar/registrant information than “chevron.com”. My conclusion: somehow the Yes Men knew about the upcoming Chevron campaign and started the spoof before Chevron or they (The Yes Men) had the campaign/spoof idea and Chevron reacted very quick w/ a counter-campaign. Anyway, that stunt was a typical Yes Men guerrilla action. Update (20101019.0409): It’s getting better. 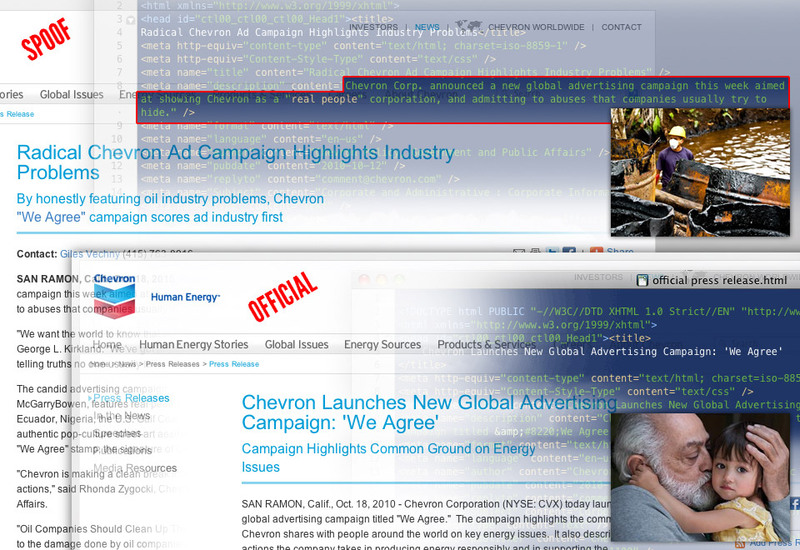 On the page «Chevron Deplores Pre-emptive Spoof Ads, Investigates Options» IP Address: 184.106.131.150 “they” link to Advertising Age’s article «Chevron “We Agree” Advertising Campaign Highlights Concerns With Oil Industry Problems» … little WHOIS: IP Address: 184.106.131.150 but every other link goes right off the spoofs address to the official Advertising Age’s website at IP Address: 205.234.169.36. 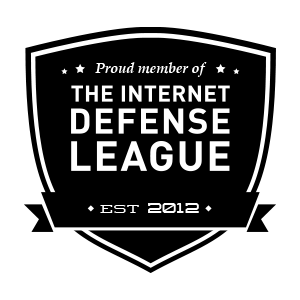 Registrant: Crain Management Services Inc.
Two duped companies on one day. Yehaa, Yes Men! This entry was posted in media and tagged activism, guerrilla, pr, spoof, web. Bookmark the permalink. Some people should hold their tongues, and their typing fingers. Seriously, if you supported the Yes Men (if it *was* the Yes Men – there are lots of others doing this, I can guarantee) then you would have just posted the adverts and press releases verbatim, as the spoofer would have liked people to, rather than showing that you know how to do a DNS search. I too spotted the hoax straight away, and then went on to repost the links all over the place because *Chevron* deserve to be exposed – not the people responsible for the subterfuge. Please consider whether it’s worth showing off next time. Seriously, why? It sounds a little like security through obscurity and I can’t say that I like it. The minute I read the (1st) press release e-mailed to me I knew it was a Yes Men spoof … why not tell? IMHO that’s part of the Yes Men show. And if I tell something I want to make it clearly based on research and valid arguments. The DNS search was just the topping and not to show that I know how to do it. The Yes Men send the press release to an address only they should have — and if not, well then they had gave my e-mail address to a third party, which I doubt. I really like the way the Yes Men do what they do and why they do it, but I see no reason for me to work the same way as the PR monkeys and Media do: without any research and substance, just blabla or to greenwash something. The Yes Men can do what they do because of the PR monkeys and Media don’t do valid and verified research. They are using the same «weapon» the big bad companies (like in «big bad wolf») are using and it works. It even works when someone like me — or others — standing on the side and laughs about the stunt and how the Yes Men do a prank again and again and again, year by year. You know why? The PR monkeys and part of the media can’t change the way they work and the companies neither. If they start telling the truth … it would be over. And while they can’t change their habit let’s have fun and expose companies like Chevron, BP and so on in a prankster way. Ps. Maybe the next time the Yes Men should not send spoof press releases too early via their newsletter system.